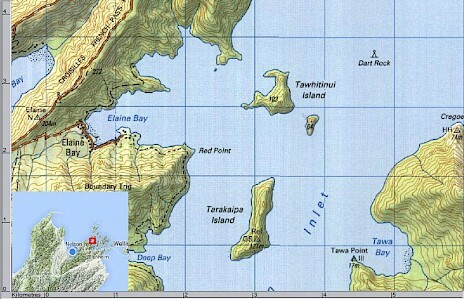 The unoccupied Tennyson Inlet islands (Tarakaipa, Tawhitinui and Awaiti Islands) are located in the head waters of the Pelorus Sound (part of the Marlborough Sounds). The focus of the TIIT project is to eradicate pests from these islands so that the bird life and biota can once again flourish. By eliminating most pest competition it is our intention to restore these islands as an ecological refuge from which adjoining areas can be repopulated. There are no other significant publicly accessible islands remaining in the Pelorus Sound so from the communities’ point of view it is vitally important that we play our part and do everything we can to restore these islands. To return the DOC Scenic Reserve Islands to a predator and pest free status so that they can again become sanctuaries for the vulnerable native biota of the Marlborough Sounds. (Biota is the total collection of organisms of a geographic region). To ensure the Tennyson Inlet Islands are available for safe public access at all times. To provide a positive natural experience for visitors in order to gain wider community participation which in turn leads to the conservancy of these Islands for future generations in perpetuity.